Sales taxes are one of the largest sources of state and local tax revenue. On average, 23.3 percent of state and local tax revenues came from sales taxes in fiscal year 2014. Combined state and local sales tax rates vary across states, with combined rates ranging from 9.98 percent in Louisiana to 5.4 percent in Wyoming. Local sales taxes are collected in 38 states. Five states do not have statewide sales taxes: Alaska, Delaware, Montana, New Hampshire, and Oregon. However, Alaska and Montana do allow localities to levy local sales taxes. 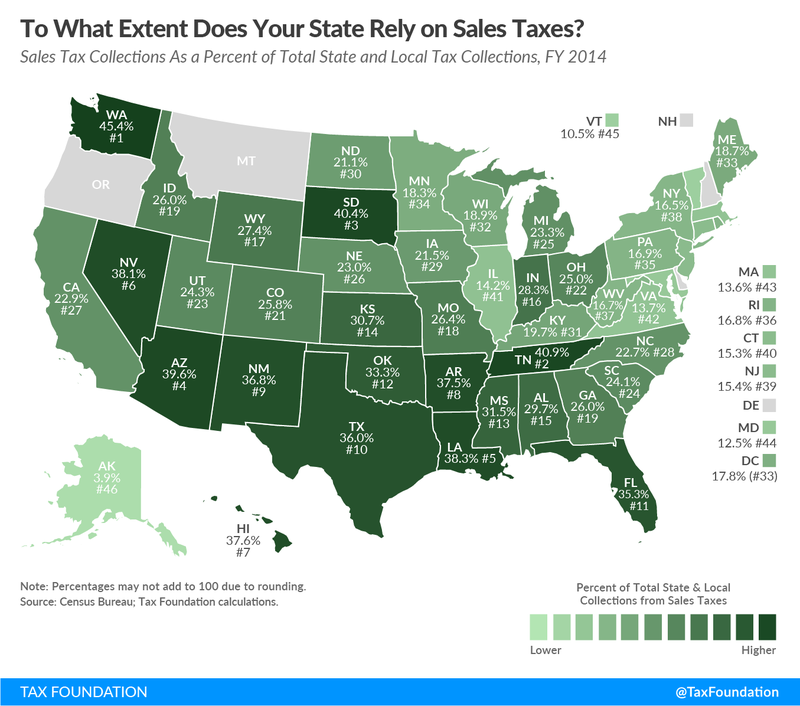 Today’s map shows what percentage of state and local tax collections derive from the sales tax. 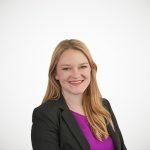 Washington depends most heavily on the sales tax (45 percent of total tax collections) due to the lack of a corporate or individual income tax rate (although they do levy a harmful gross receipts tax in lieu of the corporate income tax). Tennessee comes in second (41 percent), again because the state does not levy an individual income tax (except on interest and dividends). South Dakota is the third most heavily dependent (40 percent). It also does not impose a corporate or individual income tax. While some think the sales tax rate is the only consideration in the sales tax code, the tax base is equally important. The economy is moving away from goods and toward services, but the sales tax is levied mostly on goods and less on services. Because of this, and exemptions of certain goods (such as groceries and prescription drugs) in the tax base for political reasons, the sales tax base is narrowing. This is harmful because as the sales tax is applied to less of the economy, the sales tax rate must increase to produce the same amount of revenue. When the first sales tax was created in Mississippi in 1930, the state’s economy lacked a notable service sector, so the tax was levied on most tangible goods. As more states adopted their own sales tax, they used language similar to Mississippi’s code. That is how the exemption of services from the sales tax base is, in part, a historical accident. A properly structured sales tax code should have a broad base and apply to all final consumption. If states can apply these basic principles, it will result in stable revenue and allow for a low rate that brings in ample tax revenue. Note: This is the first in a four-part map series in which we will examine the primary sources of state and local tax collections. Other maps in this series are linked below.